Why Use the FL Studio Swing Slider? Do your drum loops sound mechanical and machine-like? Can you tell a computer made your drum loops? Does every kick, snare, and hi hat just sound a little bit too perfect? We all know that live music is not like that. The imperfection of mankind makes some hits sound slightly off by just enough to make it sound better. This is where using the FL Studio swing slider can come in handy. In this tutorial, we’ll look at a quick use case for the feature when mixing house drums. What Does the Swing Slider Do, Exactly? On the Channel rack and Step Sequencer panel in FL Studio, you’ll see a slider at the top right labeled “swing” as shown below. This swing slider gives the drums a more groovy, human feel. It removes the unrealistic sounding mechanical perfection that can only be replicated by a computer. 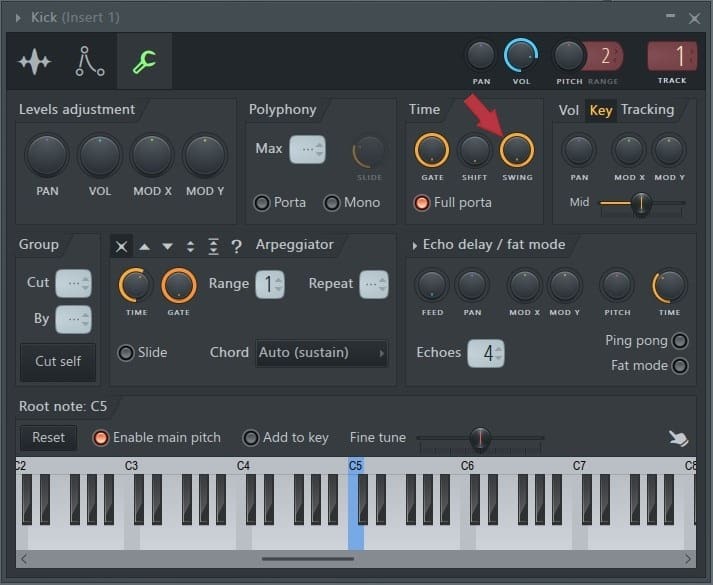 In the Step Sequencer, each button or slot is a sixteenth note. If we call the far left sixteenth note #1, the swing slider takes every programmed sample falling on even sixteenth notes (#2, #4, #6, #8, #10, #12, #14, #16) and moves them closer to their following odd sixteenth notes (#1, #3, #5, #7, #9, #11, #13, #15). 0% swing is applied when the swing slider is far left, and 100% swing is applied when the swing slider is far right. As you can hear, there is a huge difference in the feel of the drum loop. The snares falling on even steps have been shifted forward while the kicks, hi hats, and claps remain uneffected since they fall on odd steps. With swing at 32%, it sounds groovier and more human, but 100% seems to be overdoing it a bit. How Can I Apply Swing to Individual Channels? Since the FL Studio swing slider is a global setting, it will apply swing equally to all of your channels. We can adjust the amount of swing applied to individual channels by using the fancy swing multiplier knob under miscellaneous channel functions. To get there, click the desired channel you’d like to change, and then click the wrench at the top left. The multiplier applies a percentage of the global swing to your selected channel. When we turn the multiplier all the way up, we’re applying 100% of the global swing slider setting. If we set the multiplier knob to 50%, we’re only applying 50% of the global swing slider setting. Say you have your global swing set at 50%, and the swing multiplier for a channel set at 35%. Swing amount for that channel will be 50% (global) x 35% (multiplier) which is 17.5%. By default, the swing multiplier is 100%. This means the swing for each channel will be equal to the global setting unless manually changed. Using swing may take some fine tuning for each individual situation and will depend on your goal for the feel of a song. I personally find that around 30% to 35% is the sweet spot for many of the house tracks I work on. But this is all personal preference and taste. When used correctly, this can be a very powerful tool! That’s it for today. If you liked this 100% free FL Studio swing tutorial, let me know what else you’d like me to cover in the comments, on the Synaptic Sound Facebook page, or YouTube channel!